… all firms [businesses] – not just those directly and immediately affected – should be undertaking a Brexit “health check”, and a broader test of existing business plans. Are you engaging with clients on Brexit issues? With so much happening next year, MTD, and existing compliance deadlines, there is a temptation to side-line Brexit and blame the politicians for any negative fallout. A big mistake, as we must be seen to be leading from the front, building and expanding advisory services and inspiring client confidence. You are one of your clients most trusted advisors – so why are we not talking about Brexit? EU importers and exporters – an impact assessment based on a no-deal or interim outcome. Other businesses – a review of business fitness issues and the creation or revision of business plans for 2019-20 onwards. 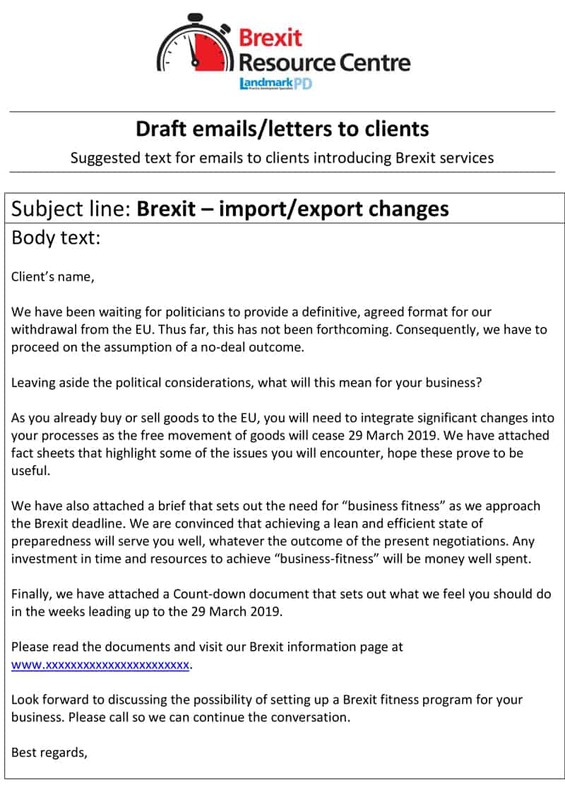 Like to increase the roll-out of Brexit support to clients? 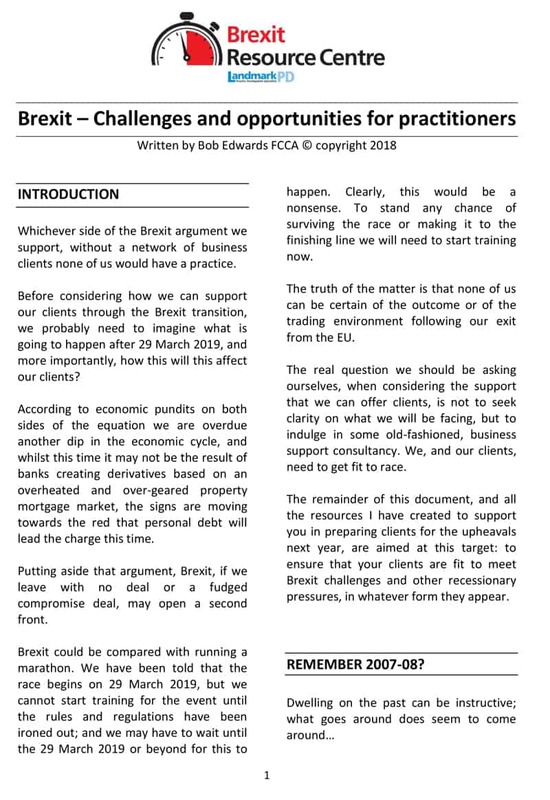 Bob Edwards has created a package of online tools, video and documentation that you can quickly adapt to speed up your roll-out of Brexit support services to clients. The documentation listed below and relevant code will be made available to you on a secure dashboard. 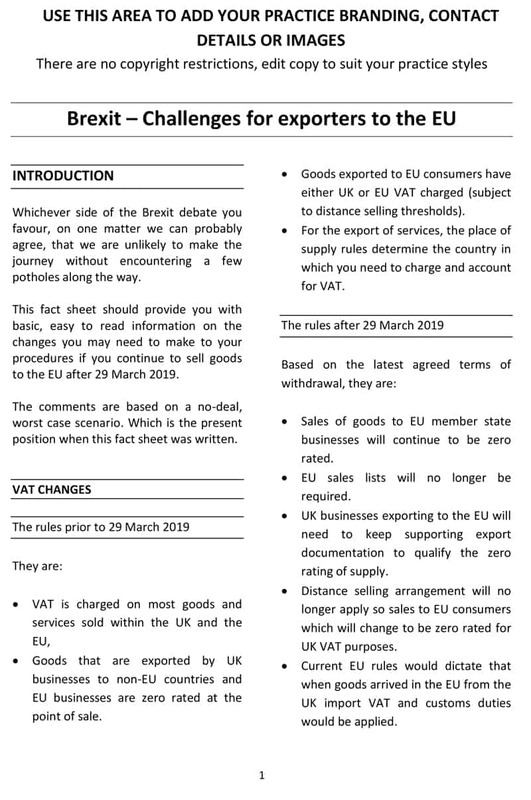 If the Brexit terms change, then these changes will be incorporated into edited material that will be uploaded to your dashboard. You will be advised if and when this happens. There will be no additional charges for these revisions up to 29 March 2019. After this date we may offer an ongoing update service to make this material relevant to the post Brexit transitional phase. When you become a subscriber to the Resource Centre, we will also provide you with the necessary code snippet to easily embed and display this useful interactive tool on your own website. The code will be uploaded to your dashboard on completion of your order. A video that explains in simple terms how we may be affected by Brexit. We provide iFrame code linked to our Vimeo hosting account so you can feature the video directly on your website. A branded version will be produced and sent to you within 7 to 14 days of receiving your order. A discussion of the issues and services that firms can offer clients as we enter the Brexit transition from 29 March 2019. 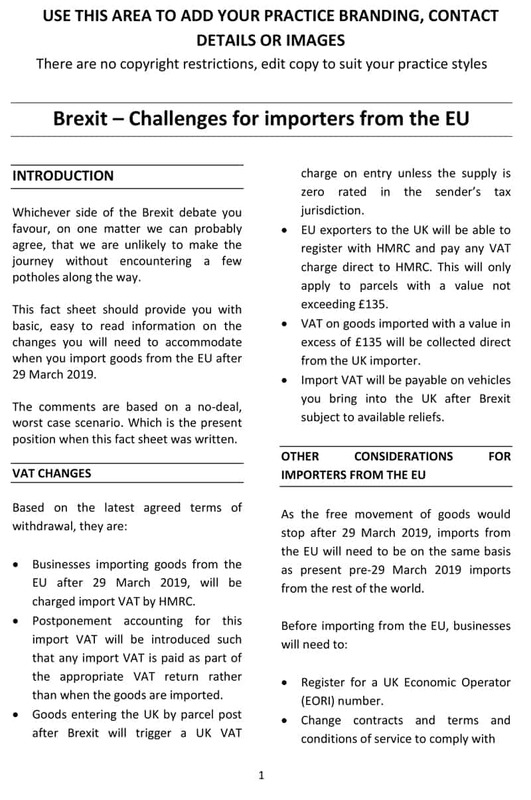 A fact sheet that sets out key changes for clients that presently import goods from the EU. A fact sheet that sets out key changes for clients that presently export goods to the EU. 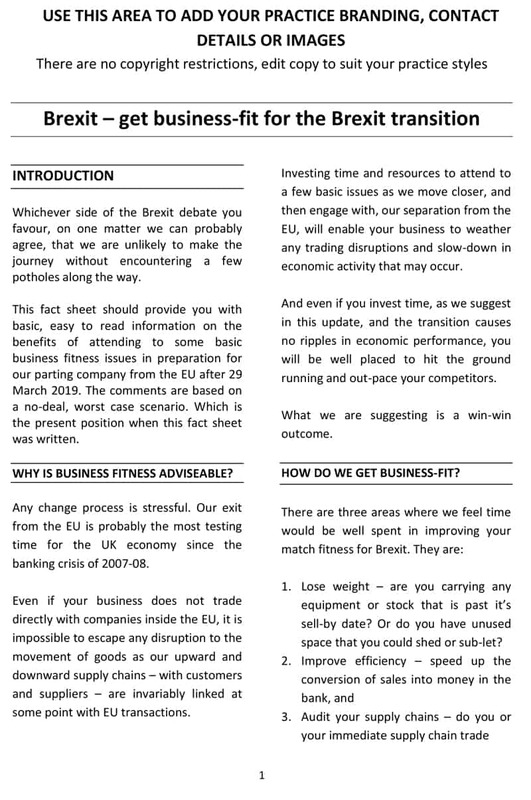 A fact sheet setting out justification for improvements to business fitness to ride out any downturn in economic activity following Brexit. 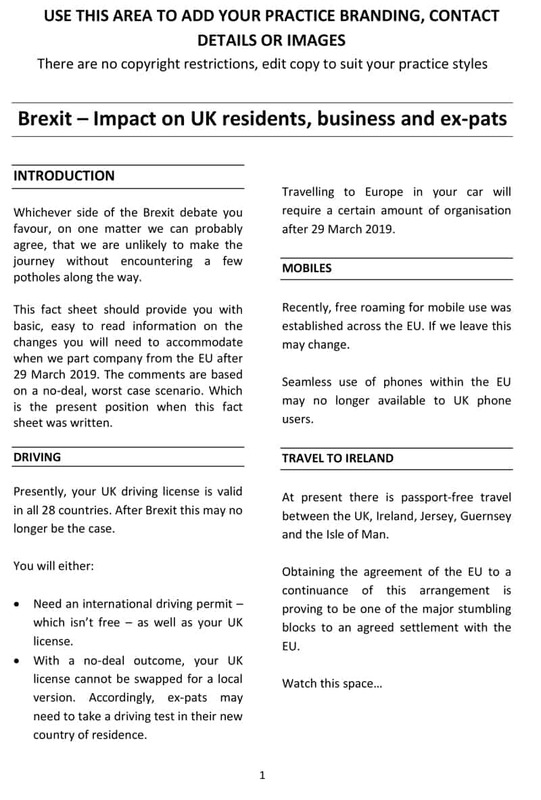 A fact sheet outlining the likely, long-term consequences for EU travel, EU employment, and other issues post 29 March 2019. A simple check list/to-do list outlining the necessary work that clients need to engage with prior to the Brexit deadline 29 March 2019. 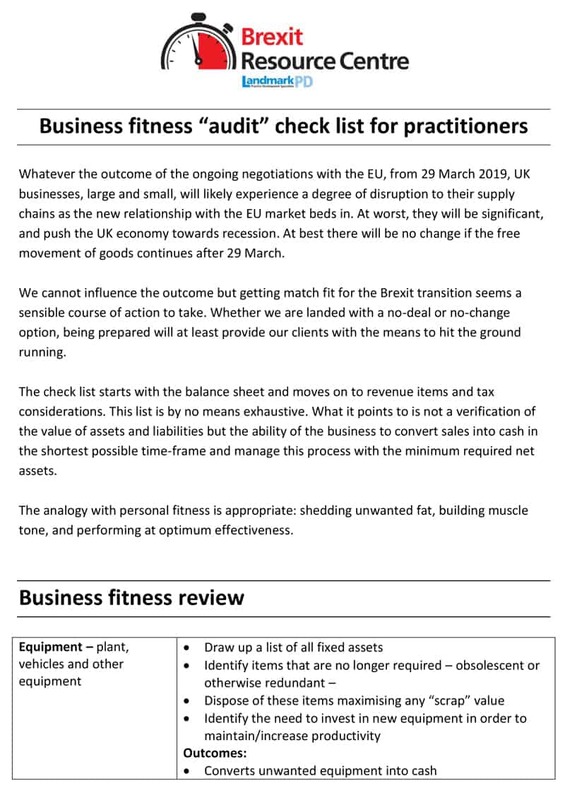 A check list detailing work to consider to get clients business-fit for the Brexit transition. Concentrates on the sales cycle and optimising net assets. To save practitioners time, we have created a number of draft emails/letters that you can use to send information and fact sheets to clients. 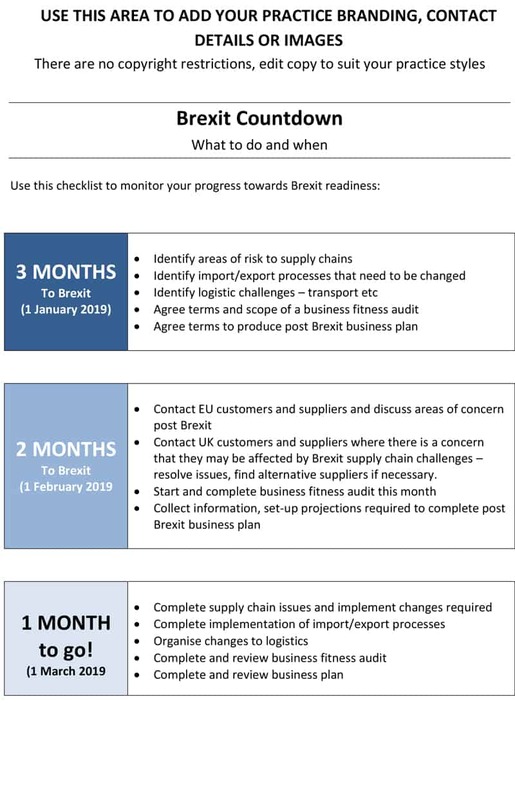 A check list outlining the work that practitioners can undertake on behalf of their clients prior to the Brexit deadline 29 March 2019. Please note that payment will be taken by Barclaycard before we are able to release your dashboard URL and access details. BSC is a subscription service. Landmark guarantees to deliver the video link, risk assessment code and any associated written material via a secure dashboard as soon as the payment process is completed. The BSC service is available on three levels: video plus interactive tool; documentation plus the interactive tool; or all three elements. The subscription fee is invoiced at the point of purchase via the Barclaycard credit card payment service. Subscribers will be provided with access to the hosted generic video link, the interactive tool iFrame code, and any document downloads – in all cases this will be facilitated by providing a user dashboard.